HEALING HANDS OF GOD is a true story written by Suzan Custer Oxtal to glorify God and to share with others that real life miracles happen today, like they did in Biblical times. You will be inspired by God’s power and grace as He guides the family through the unexpected life-threatining crisis with their newborn baby. This account of the events surrounding Oxtal and her family conveys the highs, lows and roller coaster ride of emotions they experienced. HEALING HANDS OF GOD started out as a chronicle for Oxtal’s two adult sons. Twenty-one years after witnessing a miracle, Suzan was prompted by the Holy Spirit to share her story with a friend. Much to Oxtal’s surprise her friend suggested she publish the story. After struggling with the idea of sharing this experience with others she followed through. 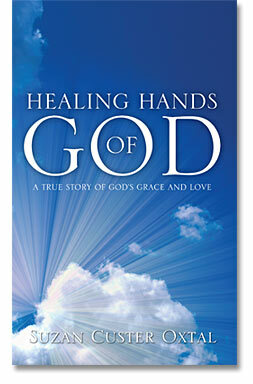 HEALING HANDS OF GOD, a true and inspirational story about God’s power and grace, is available in paperback for $10.99. Copyright © 2019 Suzan Custer Oxtal.